One of the selection rules which follows from parity conservation is the following: A spin zero boson cannot decay sometimes into two &pgr; mesons and sometimes into three &pgr; mesons, because these final states have different parities, even and odd respectively. But the positive K meson is observed to have both these decay modes, originally called the Θ and the &tgr; mesons, respectively, but later shown by the identity of masses and lifetimes to be decay modes of the same particle. This &tgr;-Θ puzzle was the first observation of parity nonconservation. In 1956, T. D. Lee and C. N. Yang made the bold hypothesis that parity also is not conserved in beta decay. They reasoned that the magnitude of the beta-decay coupling is about the same as the coupling which leads to decay of the K meson, and so these decay processes may be manifestations of a single kind of coupling. Also, there is a very natural way to introduce parity nonconservation in beta decay, namely, by assuming a restriction on the possible states of the neutrino (two-component theory). They pointed out that no beta-decay experiment had ever looked for the spin-momentum correlations that would indicate parity nonconservation; they urged that these correlations be sought. In the first experiment to show parity nonconservation in beta decay, the spins of the beta-active nuclei cobalt-60 were polarized with a magnetic field at low temperature; the decay electrons were observed to be emitted preferentially in directions opposite to the direction of the 60Co spin. The magnitude of this correlation shows that the parity-nonconserving and parity-conserving parts of the beta interaction are of equal size, substantiating the two-component neutrino theory. It was at first somewhat disconcerting to find parity not conserved, for that seemed to imply a handedness of space. But this is not really the situation; the saving thing is that anti-60Co decays in the opposite direction. Thus, after all, there is nothing intrinsically left-handed about the world, just as there is nothing intrinsically positively charged about nuclei. What really exists here is a correlation between handedness and sign of charge. an economic term expressing the ratio between the currencies of various countries. Until World War I, before which gold or silver circulated as money and paper money could be freely exchanged for gold, the mint parity was used. The ratio between foreign currencies was based on the amount of pure gold or silver contained in the respective monetary units of the different countries. When paper money that was not exchangeable for gold began to circulate after World War I, the mint parity was replaced by currency parity, which reflects the ratio of currencies according to the nominal amount of gold in the national monetary units as officially determined by the respective governments (seeEXCHANGE RATE). Under the gold standard the parity value of currency and the level of domestic prices changed in conformity with changes in the gold content of the national monetary unit. However, with the abolition of the gold standard in the mid-1930’s, countries were compelled to alter the exchange parity of currencies and the gold content of the national monetary unit according to the movement of domestic prices. The exchange parity of the currency is adjusted to bring the purchasing power of the national currency closer to the purchasing power of other currencies. The relationship between the currencies of different countries, based on equivalence of purchasing power, expresses the relative purchasing power of different currencies. In foreign-exchange markets currencies are not exchanged at their official rates, or parities, but rather according to an exchange rate that deviates from parity in accordance with fluctuations in the market supply and demand for the particular currency. During monetary crises, these fluctuations become very severe. In socialist economies, the exchange parity of the currency is established by the state on a planned basis according to the gold content of the currency and a comparison of the purchasing power of the national currency in the domestic and world markets, respectively. The exchange rates of the socialist countries fluctuate only in relation to the capitalist currencies, depending on the market deviations in the exchange rates for the latter. the principle of equal representation of parties. Commissions to review border disputes, for example, are formed on the basis of parity. The principle of parity is most commonly applied in conciliation hearings on labor disputes and conflicts. For example, in the USSR, commissions on labor disputes are formed from an equal number of representatives of the workers and of the administration. a quantum-mechanical characteristic of the state of a physical microparticle, for example, a molecule, an atom, an atomic nucleus, or an elementary particle. Parity represents the symmetry properties of the wave function of such a microparticle with respect to mirror reflection. In processes resulting from strong interactions and from electromagnetic interactions, the law of parity conservation holds; that is, a physical system having mirror symmetry of a definite type in the initial state retains that symmetry at all later moments in time. The conservation of parity leads to a number of selection rules in the electromagnetic radiation of atoms and atomic nuclei, in nuclear reactions, and in reactions involving transformations of elementary particles. The law of parity conservation may be demonstrated by using the Zeeman effect as an example. When a magnetic field is applied, the intensity of the radiation in individual spectral lines remains symmetric with respect to the plane perpendicular to the field but is no longer identical in all directions. The radiation in the direction of the magnetic field is the same as the radiation in the opposite direction. If we imagine a system—in the form of a current-carrying circular conductor with a specimen placed at the center of the circle—for observing the Zeeman effect, the mirror symmetry of the system becomes obvious, but only on the condition that all the elementary particles composing the system have mirror symmetry. Thus, the law of parity conservation is based on the assumption that all electrons, protons, and other particles are transformed into themselves under mirror reflection. Instead of mirror symmetry with respect to a plane, it is more convenient to consider an operation that entails the inversion of coordinate axes: r→ –r or x →; – x. y→ – y,z→ – z (seeSPACE INVERSION). The law of parity conservation governs the transformation properties of physical quantities under the inversion of coordinate axes. Thus, from the assumption that a charged particle— for example, an electron—is transformed into itself under inversion, it follows that electric charge q is a scalar, current density j and electric field strength E are true (or polar) vectors, and magnetic field strength H is an axial vector (or a pseudovector): q → q’ –, j′, E → – E ′ H → H ′. The law of parity conservation is violated in weak interactions, which—in particular—are responsible for the beta decay of nuclei. The violation was predicted in 1956 by Tsung Dao Lee and Chen Ning Yang. It was confirmed experimentally in 1957 by Chien Shiung Wu and co-workers in the beta decay of nuclei and by the American physicists L. Lederman and R. Garwin, as well as other scientists, in the decay of muons. Parity is also not conserved in the decays of charged pions, kaons, and hyperons. The Soviet physicists Iu. G. Abov, V. M. Lobashev, and others discovered the nonconservation of parity in weak nucleon-nucleon interactions. A diagram of Wu’s experiment is shown on the left in Figure 1. A specimen containing the radioactive isotope 60Co was placed in the magnetic field H of a circular current. 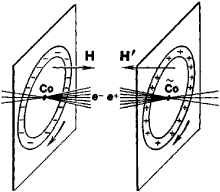 The field H oriented the relatively large magnetic moments of the 60Co nuclei in the direction parallel to H. The short arrow on the left in Figure 1 indicates the direction of the electron velocities within the conductor. As in the example of the Zeeman effect, Wu’s system was mirror symmetric with respect to the plane in which the circular current flowed. If the law of parity conservation held, the intensity of the electron (e–)emission during β– decay should have been the same on both sides of the plane in which the current flowed. However, a pronounced asymmetry was observed in the experiment: 40 percent more electrons were emitted on one side of the plane than on the other side. From Wu’s experiment, it follows that magnetic field strength is a polar vector rather than an axial vector. This is not inconsistent with the equations of electrodynamics if we assume that current density and electric field strength are axial vectors and—at the same time—that electric charge is a pseudoscalar. The identification of charge as a pseudoscalar means that, under mirror reflection, electrons are transformed into positrons (e+) and, in general, all particles are transformed into their respective anti-particles. The possibility of such an interpretation of reflection was pointed out by the American scientists E. Wigner, G. Wick, and A. Wightman as early as 1952. L. D. Landau referred to mirror reflection accompanied by the replacement of all particles by their antiparticles as combined inversion. The hypothesis that the laws of nature are symmetric with respect to combined inversion is expressed by the law of the conservation of combined parity, which is usually called the law of CP conservation. When the law of parity conservation is replaced by the law of CP conservation, the scheme of Wu’s experiment is no longer mirror symmetric, since the β+ decay of an an-ticobalt nucleus, C͂o, in the magnetic field of a circular positron current is the mirror image of her experiment (Figure 1, on the right); an anticobalt nucleus consists of antiprotons and antineutrons. Since the charge of the positron is positive, the sign of the current changes if the positrons move in the same direction as the electrons. A change in the sign of the current leads to a change in the sign of the magnetic field (H′). Thus, the law of parity conservation is approximate and holds only when weak interactions are ignored. The conventional treatment—where, for example, H is an axial vector—of the transformation properties of electromagnetic quantities with respect to the inversion of coordinate axes is valid to the same extent to which the law of parity conservation holds. In quantum theory, the parity of a state of a system consisting of n particles is defined as the eigenvalue of the parity operator P, which inverts space. The action of the operator P on the state vector ψ(p1, . . . , pn) consists in a change of the signs of the particle momenta pi and in the multiplication of the parity of the state vector by the product Π1 . . . Πn of the intrinsic parities of the particles. Intrinsic parity is an inherent property of a particle and is equal to either + 1 or – 1. Particles for which Πk = 1 are said to have even parity, while particles for which Πk = –1 are said to have odd parity. For example, the intrinsic parity of neutral pions is odd. The intrinsic parities of antiparticles with half-integral spin are the opposite of those of the respective particles. For this reason, in particular, mesons consisting of a quark and an antiquark with zero orbital angular momentum—for example, pions, kaons, rho mesons, and omega mesons—have odd intrinsic parity. The operator P does not act on spin projections or on charges. The eigenvalues of the operator P are equal to ±1. States with P = 1 are called states of even parity; states with P = – 1 are known as states of odd parity. Second, the parity Π12 of a complex system consisting of two subsystems with respective parities Π1 and Π2 is equal to Π1 Π2(–1)L, where ℏL is the orbital angular momentum associated with the relative motion of the subsystems. Electromagnetic field quanta have neither intrinsic parity nor orbital angular momenta. The parity of a quantum of electromagnetic radiation, or a photon, is determined by the quantum’s multipole order (seeMULTIPOLE). The parity of an electric 2l-pole is equal to ( –1)I, while the parity of a magnetic 2l-pole is equal to (–1)l + 1. Therefore, the parity of a physical system is conserved when an electric multipole quantum with even l or a magnetic multipole quantum with odd l is emitted or absorbed. It is reversed when an electric multipole quantum with odd l or a magnetic multipole quantum with even l is emitted or absorbed. The parity selection rules for the electromagnetic radiation of atoms and nuclei result from the fact that, for identical multipole orders with all other conditions being equal, magnetic multipole radiation is substantially weaker than electric multipole radiation. The ratio of the probabilities of magnetic and electric multipole radiation is of the order of (2πR/λ)2, where R is the linear size of the radiator and λ is the wavelength of the radiated quantum. As a rule, the ratio is much smaller than unity for both nuclei and atoms, so that the parity selection rules are markedly exhibited. The law of parity conservation, which is also called P invariance, is formulated as the conservation of the quantity P in strong and electromagnetic interactions. The concept of the intrinsic parity of a particle and, thus, of the parity of a state contains a certain degree of ambiguity, which is associated with the impossibility of comparing the parities of states that differ in the values of just one of the conserved charges, for example, electric charge or baryon charge. Therefore, in particular, the parity of the vacuum state and the parities of the proton, the neutron, and the electron are arbitrary and may be assigned positive values. However, in this case, the parities of, for example, a pion, the positron, and the antiproton become well defined and must be assigned negative values. The fundamental question of the symmetry of real space with respect to mirror reflection is closely associated with the concept of parity. The methods of group theory have been used to prove that, if space has mirror symmetry, either the law of parity conservation or the principle of CP invariance must be strictly satisfied. The violation of both the law and the principle in weak interactions has been established experimentally. Therefore, grounds exist for postulating that either space does not have symmetry between left and right or such symmetry is broken in certain types of interactions. An example of such interactions is the interactions that result in the decay of the long-lived neutral kaon, K°L → 2π. Abov, Yu.G.,etal. Physics Letters, 1968, vol. 27B, no. l,p. 16. Lobashev, V. M. Vestnik AN SSSR, 1969, no. 2, p. 58. Wigner, E. Uspekhi fizicheskikh nauk, 1958, vol. 65, issue 2, p. 257. Wick, G., A. Wightman, and E. Wigner. Physical Review, 1952, vol. 88, p. 101. Landau, L. D. Zhurnal eksperimental’noi i teoreticheskoi fiziki, 1957, vol. 32, issue 2, p. 405. Shirokov, Iu. M. Zhurnal eksperimental’noi i teoreticheskoi fiziki, 1958, vol. 34, issue 3, p. 717. Shirokov, Iu. M. Zhurnal eksperimental’noi i teoreticheskoi fiziki, 1960, vol. 38, issue 1, p. 140. The use of a self-checking code in a computer employing binary digits in which the total number of 1's or 0's in each permissible code expression is always even or always odd. Two integers have the same parity if they are both even or both odd. A physical property of a wave function which specifies its behavior under an inversion, that is, under simultaneous reflection of all three spatial coordinates through the origin; if the wave function is unchanged by inversion, its parity is 1 (or even); if the function is changed only in sign, its parity is -1 (or odd). Also known as space reflection symmetry. b. a quantum number describing this property, equal to +1 for even parity systems and --1 for odd parity systems. The brand parity scale was measured by a 5-item scale proposed by Muncy (1996). The push for parity comes on the heels of a spike in the number of individuals with mental disorders. These breed differences indicated that purebred Y sows produced lower number of piglets born and weaned, and lighter piglets at birth in the first parity (NBA1, NPW1, LTBW1) and for the sums from the second to last parities (NBA2+, NPW2+, LTBW2+). Obama administration officials have used the essential health benefits package provisions in the Affordable Care Act to apply the MHPAEA parity requirements to all individual and small-group major medical plans issued since the ACA became law. Bendat said remedies for mental health parity law violations that might occur in the administration of plans purchased through exchanges created by the Affordable Care Act have yet to be tested, although he thought the recent ruling might strengthen any legal theories plaintiffs in those situations might employ. We're not saying that these reports are actual violations of the parity law, but that they are documented issues that patients and treatment centers are facing. If fa parity or parity-if-offered were legislated, the treatment rates in all facilities climbed by 13% (P = . A manager using a risk parity strategy thinks about how to balance risk differently than a manager of a traditional portfolio, says Josh Cohen, defined contribution practice leader at Russell Investments in Seattle. However, as the primary focus of parity is on the removal of treatment limitations for behavioral health services, parity should have relatively little impact on prescription drug expenditures. Swiss investment manager Lombard Odier was one of the earliest adopters in Europe, applying risk parity to its own defined benefit pension fund in 2009. 12) Flarkck appealed the grant of summary judgment to the United States Court of Appeals for the Ninth Circuit, arguing that her residential treatment at Castlewood was covered under her plan with Blue Shield and, if not, that the treatment was covered under the terms of the Parity Act. CONCLUSIONS: The desire for sons appears to be a significant motivation for parity progression.